When you are out walking in the African bush , you might be forgiven for mistaking that dry grass coloured stick for a piece of dead plant . Approach it closer and the prayer like attitude of its huge raptorial forelegs begins to unfold , you have probably come across a praying mantis . Order Mantodea is Greek for Soothsayer , comes from an attitude of prayer that they are mostly found in when observed in the field . This attitude masks a deadly predator . The praying mantis The praying mantis is an amazing creature , they use camouflage to hide away and patiently wait for an insect to come within range , they then grab their hapless victim with a lightning quick jab of their raptorial , spiked forelegs and then administer the coup de grace with ( sideswiping crunching )the chewing mouthparts . At night their camouflage becomes irrelevant and it has been discovered that they have a cyclopean ear on the thorax , this enables them to pick up the echo location activity of bats and enables the mantis to avoid them quite drastically by simply falling out of the sky when they detect the bats sonar emissions. 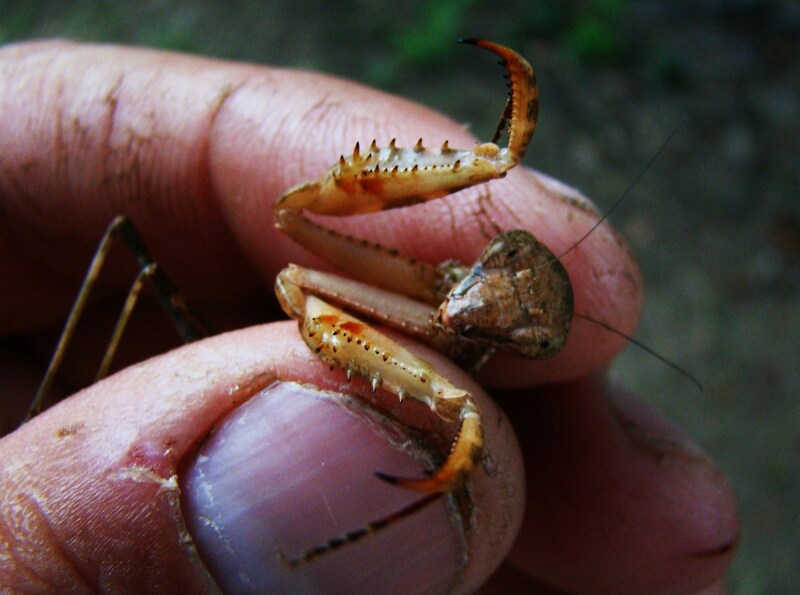 The best way to observe the micro fauna on a walking safari is to turn your binoculars upside down , which transforms them into a microscope , magnifying the subject many times .looking at a praying mantis in this way transforms them into creatures from the movie “Men in Black ” . A magnified view shows them to have a smallish , characteristically triangular head , which uniquely among the insects they can swivel one hundred and eighty degrees . This allows them to turn their heads and zone in on potential prey . They have huge compound eyes that are multi faceted and are extremely adept at detecting the slightest movement while they are in ambush mode , they could easily be mistaken for a dry grass stalk or a stick or leaf on a plant at this stage . The male praying mantis is extremely wary of the female mantis as they have been known to engage in sexual cannibalism on occasion . This does not happen always and a slick male can escape his partner. 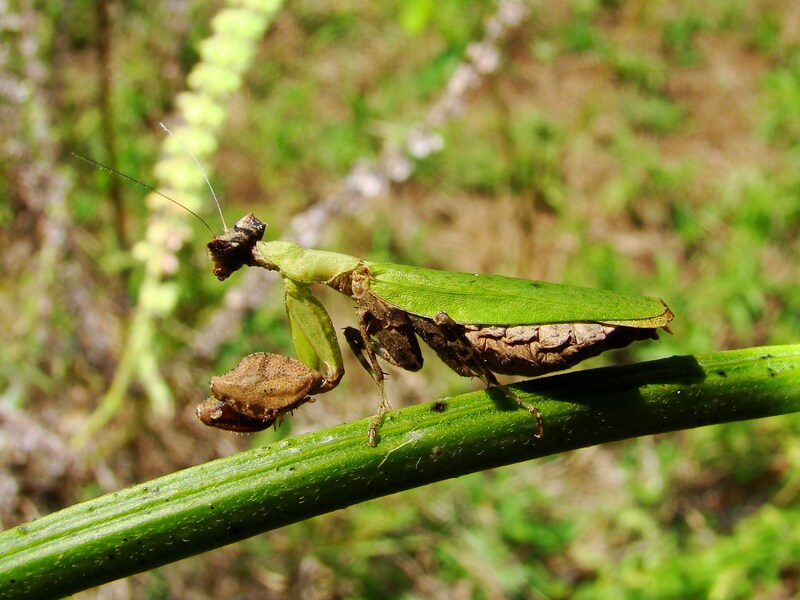 Some mantis species have a system of nerve ganglions that are spread through the head and thorax , if the mating female does happen to capture the male while they are mating , she might well start to feast on him while they are copulating . This sinister predatory action usually begins with the female eating the males head first , and will eat him in totality as they progress in procreation . This is the ultimate sacrifice on the part of the male to perpetuate the species . It is thought that he provides a very necessary supplement to her diet when she starts to lay her eggs, which can number up to 60 depending on species . 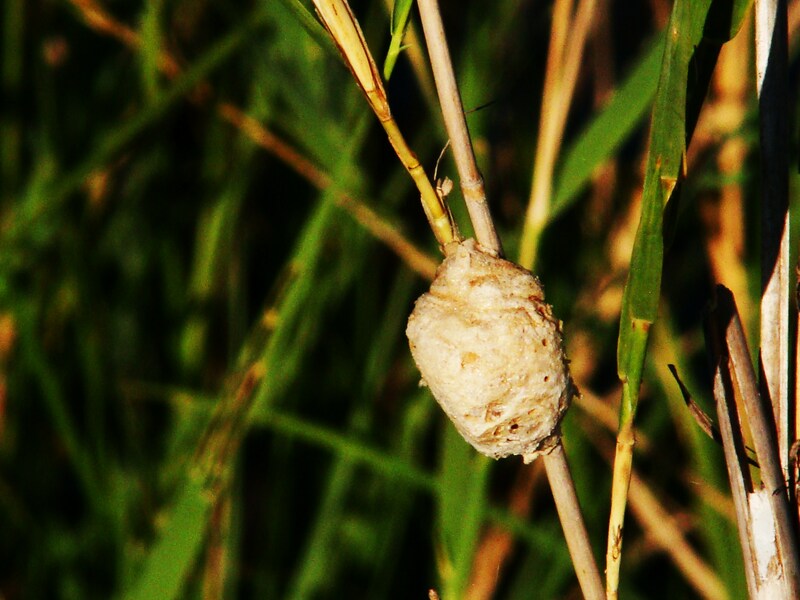 These eggs are enclosed in a frothy mass , called a ootheca , which of course requires a lot of energy on her part .The ootheca is deposited in the darkness on a grass stalk or a small branch and is quite vulnerable to the elements .